CALL 01268 768 768 NOW AND WE WILL BEAT WHAT YOU PAY! Reduces dirt and drywall dust spreading on job sites. Use on interior entrances to reduce job site dirt movement and protect floors from dirt and dust. Anti Slip backing keeps the mat in place. 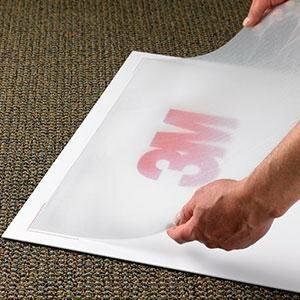 Sticky mats are typically used in clean rooms and construction sites. Their purpose is to prevent contaminants from entering the site with personnel, and hazardous materials from exiting. 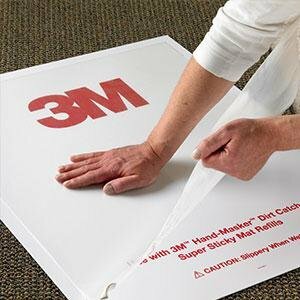 Sticky mats can be temporary or permanent. Temporary sticky mats are made of a stack of adhesive plastic adhesive film layers that are periodically peeled off and thrown away. Permanent mats are made of a polymer, usually polyester- or polyvinyl chloride-based, that binds particles through electrostatic forces. The peeling process for temporary mats may dislodge particles from the mat, causing inhalation risk. However, permanent mats must be washed with a mop and detergent, which is more time-consuming and may be done less often. A 2012 study found that temporary adhesive mats reduced the particle level on shoes and overshoes by 25–50% while permanent polymeric flooring reduced it by approximately 80%, and that adhesive mats released more particles when they were dirtier and when they were peeled quickly. We will beat what you pay! Tacky mats or ‘sticky mats’ are specialist mats which have a sticky, adhesive top. They are designed for highly effective dirt and dust removal. They are used to obtain a dirt free, sanitary environment that is required in areas such as factories, computer rooms, clean rooms, warehouses, school gymnasiums, healthcare facilities and more. The sticky layer of the cleanroom mats collect fine particles of dust and dirt, to prevent them from being tracked into sensitive areas and to avoid contamination. 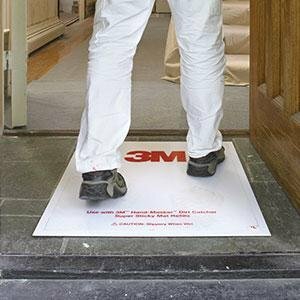 Our Clean Stride Adhesive Tacky Mats have multiple, replaceable layers that can then be peeled away and disposed of once they are used, to reveal a fresh tacky mat layer to continue effective dust removal.